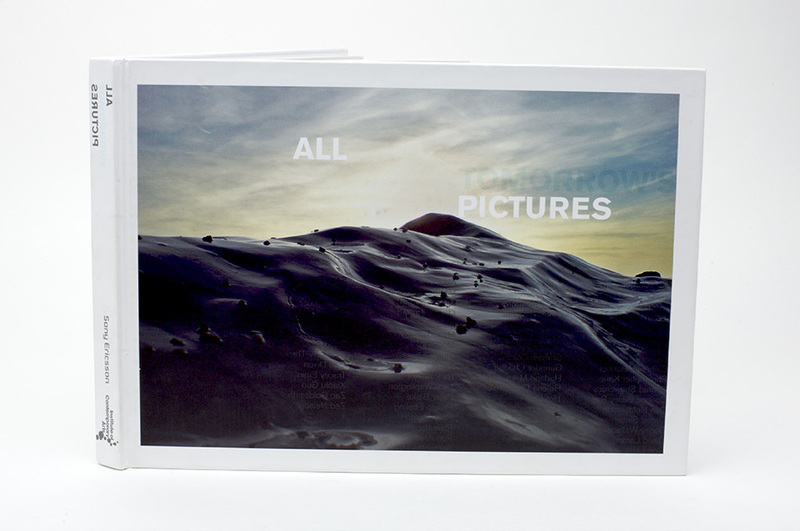 Fruitmachine were asked to design the book ‘All Tomorrow’s Pictures’, a celebration of the ICA’s 60th anniversary. The book was a collaboration with some of Britain’s leading artists, thinkers and creatives including Tracey Emin, Jake and Dinos Chapman and Idris Kahn. Each delivered a unique response to the question “What Will Tomorrow Look Like?” by taking a photograph on a Sony Ericsson mobile phone. The book was launched at the ICA with a gala auction and party. Fruitmachine worked closely with ICA, to create a book that communicates the concept “What Will Tomorrow Look Like?”. The 3.2 megapixel resolution of the Sony Ericsson K800i determined the maximum format we could use when resampled to 300dpi, subsequently this defined the format of the publication. The concept of TOMORROW led to our decision to spot varnish the word ‘TOMORROW’ from the book title on the cover and having the solid lettering on the back. By tweaking the logo in this way, avoided the problem of having to use the actual logo Sony had supplied on the cover, as there was no obvious way to overlay this with any chosen cover images. The spot varnish became a main design treatment throughout the book – mimicking the cover – artist information always followed the images submitted, as the most important aspect of the book was the actual artist visions of tomorrow.